Sorry about stealing someone else's image, but I don't have a good one handy. Traditionally a meal is cooked in this over a fire and often on its own charcoal based burner. However nowadays it is not necessarily the vessel that the cooking is done in so much as the way the food is spiced and served. As far as Morocco goes it is as common as bread. 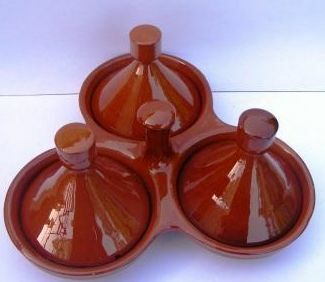 Many restaurants serve little but tajine, and though the meat in it might vary, the basic recipe does not. The next most common foods are the flat bread and olives that come with everything, and the Moroccan salad, which is a simple mix of finely chopped tomatoes and onions with perhaps some cucumber and maybe a simple dressing. You can also get almost everywhere brochette, basically meat grilled on a stick, or maybe brochette sandwiches. some of which are made with french fries inside. They do make good fries here, though don't always have much on them. Tajines pots are also often available in small sizes for spices or ornamental purposes. This style is very commonly used to hold salt, pepper and cumin for use at the table, cumin being as commonly used as, well...salt and pepper. The tajines often have several vegetables cooked with the meat, or maybe without meat, carrots and potatoes being most common and they arrive at the table sizzling hot. Cous cous we had less that we would have liked. For starch purposes, we got tired of bread and fries but cous cous was not as common as we thought it would be and when it was served it was sometimes served to feed 4 and we did not want that much food. when we did have it, we did enjoy it though. At places near the coast we aimed for fish, and it was typically very simply prepared too, with sometimes a basic batter but often just grilled with perhaps a bit of salt. In Marrakesh we had snails several times as a snack, twice one day. 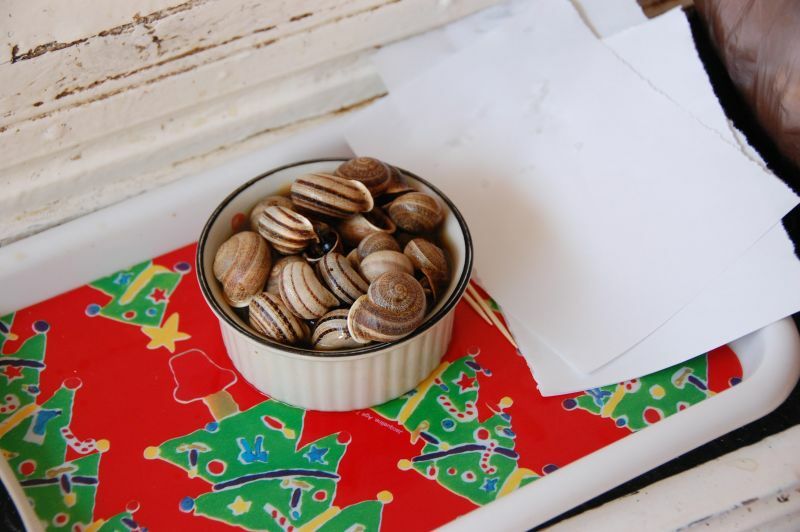 Served in a peppery broth, a dish like this cost about a dollar, and came on a Christmas tree tray at no extra charge. As for drinks, water was the norm when it was not coke or orange juice or coffee. The O.J. was always fresh squeezed, and the coffee always good and strong and often a cafe au lait, for under a dollar. As far as alcohol was concerned Morocco is not exactly a dry country, but almost so. You can get booze in the major cities if you try hard hard enough, and maybe small centers if you know the right people. We did not try hard, or know the right people, so after almost 3 weeks when we found out that Essouira had a an alcohol shop we searched it out. Lonely Planet did not quite have the location right but were not far off so we did find it. 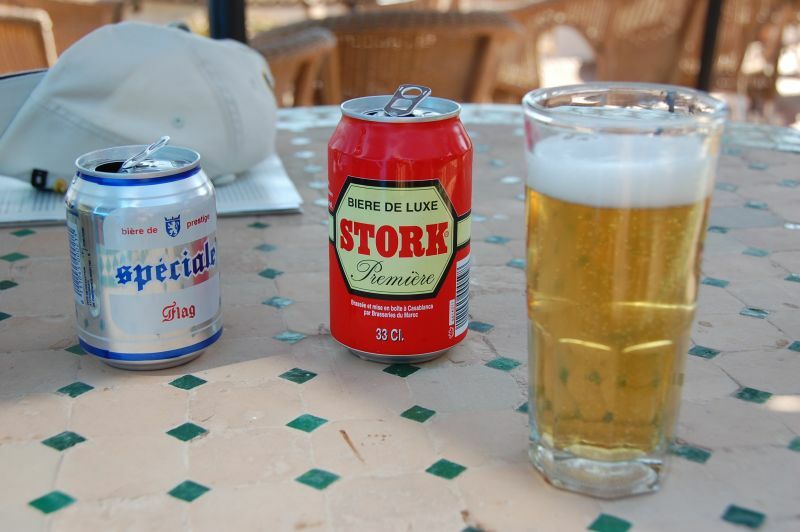 Twice in the 3 days we had beer in that town, but we were still discreet back at our Riad with it. Anyway after weeks of this and similar food, when we got to Marrakesh we actually had pizza at a place a block from our hotel. It was great but also happened to spiced with cumin of all things. And in Agadir, on the last night we had good old pasta, and lasagna! Oh yeah the last night...next post.